The Tin Box was started in 1995 (AD) by Kari and Sean Meggs – two bold and crazy Albertans with a singular purpose: to open up something artsy, trendy, and urban to throw into the retail mix of Canmore; something one would find on Queen Street in Toronto or Kitsilano in Vancouver. The original Canmore store was small, but over the next 11 years it expanded three times to make space for the overtly unique merchandise Sean and Kari found. 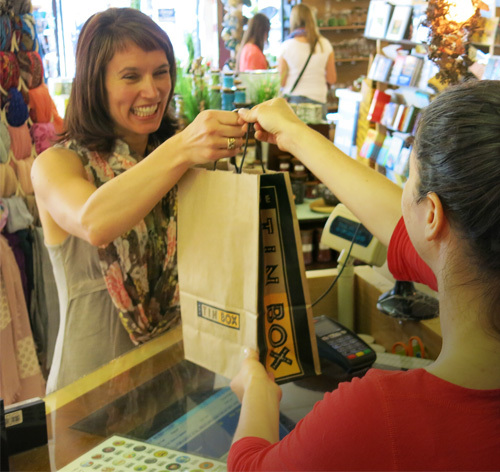 Over the years, The Tin Box opened additional outlets in Edmonton and Cochrane, but in 2014 the gleesome twosome decided to pare down to one original store on the Main Street in Canmore, Alberta. Keeps things simple, focused and uncomplicated! Shopping with a smile at the Canmore store.